The Candidates’ Debate took place in the SLC Great Hall on Feb 4. 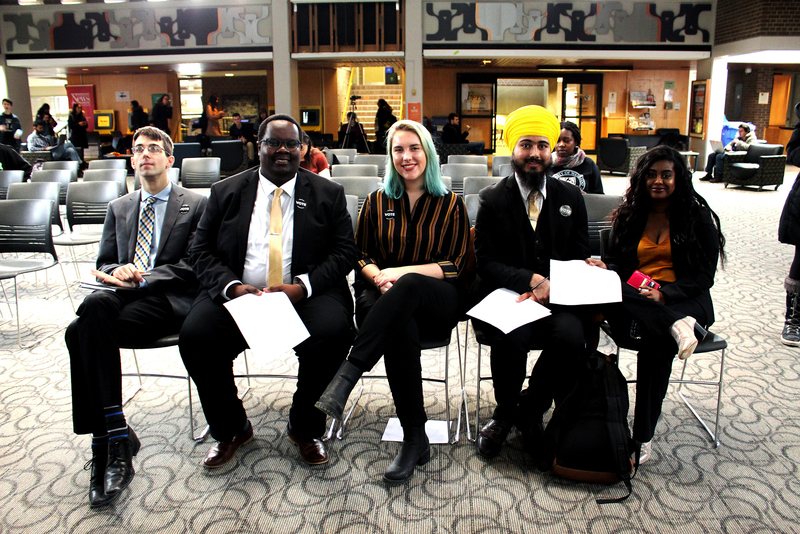 Candidates were asked a number of questions ranging in topics from OSAP to sustainability on campus. The election begins on Feb 5 at 10 am , and will last until Feb 7 on vote.feds.ca. Many people were dissatisfied with how the closure of the Bomber was handled. Had you been in the VPOF position at the time, how would you have handled it? In light of the new changes made to OSAP by the Ford government, how will Feds continue to advocate both for the students and themselves? In light of the changes to OSAP, we have to consider that a lot of our students are affected … there are two ways that I want to go. One, we need to talk to the provincial government and make it clear that these changes to OSAP affect not only students in their own ridings, but also a lot of ridings that the conservative MPPs especially, represent all across Ontario. The Federation of Students under me has already developed a system of sending out emails providing people with the opportunity to send emails to their local MPPs. The second piece that I would like to highlight is that there is also a lot of federal financial aid that falls under the federal system, and that’s something that I think we should be focusing our advocacy efforts on going forward. This is going to be really advocacy-based. I think we’re going to need to understand who this affects the most, this affects the most vulnerable of students, we need to protect them. My team and I, not just as candidates, have been doing a lot of on-the-ground work in terms of getting students to sign petitions or to protest and that is something that we will continue to keep doing. And students united will never be defeated. Essentially, it’s really important to recognize the power that we have as students. Our government fears us because we’re the ones that vote them in… if we can continue to advocate for all of these different things, as long as we’re here together mobilizing, so I think that’s how we can address those issues. Everybody has mental health as a part of their platform. What will you do specifically to better mental health on campus and why do you think that’s the best way to go? I think, with a lot of the conversations that we have been having, they’ve been very focused on predominately on peer support and counselling and, as amazing as those are … I think what we need to be doing is focusing on more of an upstream approach and trying to focus more on the barriers that are in place and the systemic issues that are actually causing mental health issues because if we wait until the point where people need to go to an emergency counselling appointment, you’re too late. It’s great to have a diverse set of counsellors, which is something we are also pushing for. That’s why I’m running for VP Student Life because I want to make sure that student life on campus and campus wellness is ingrained in every part of how our campus runs and that’s why I want to create an upstream mental health resource that works on both mental health and student life that will match every single student with all the clubs, services, and resources both on and off campus that can help their mental health. We’ve been talking about having QPR training for staff, faculty, and student leaders here and that’s also multifaceted. Another thing that we’ve been focusing on in our campaign is multilingual counsellors. A fifth of our university is international students, maybe some of them aren’t comfortable enough to talk about their own issues, so we really want them to feel comfortable to go to counselling, to have multilingual [counsellors] so they could really talk about all these issues if they do have them. And overall mental health, again, we want to really support the services we have in societies so that when students are having problems, they can really look up to the student leaders and they can help find resources there. As a position with few clear-cut responsibilities, how do you view your position as president and how will you support your VPs? Simon Griggs read from a panphlet describing the role of the president, as written by Richard Wu. As the chief executive officer and primary spokesperson of the Federation of Students, I would be responsible for representing the undergraduate membership of the University of Waterloo to the University Senate, Board of Directors, and a number of university committees. Within Feds, the president frequently collaborates with and serves as a resource to the other executives and is also responsible for overseeing all aspects of student government including general meetings, elections, and referenda. Externally, the president frequently advocates, in collaboration with the vice president of education to the provincial and federal governments on undergraduate student dealings.’ I’d like to thank whoever wrote this. Thanks, Richard. I would like to transfer the skills that I have developed over the years as a past service coordinator and exec for various clubs and the overall experience I’ve gained at the [Grand River] Hospital … as the president, I see the role as someone who brings people together, keeps everyone accountable and on task, making sure that everyone is working at their maximum capacity, they’re utilizing their talents. So, as president, I would see myself as someone who would bring my team together and ensure that everyone is utilizing their skills to the maximum ability. Right now, the feds directive functions under a horizontal structure. If Team ignite is elected , we would like to change that a little bit just to make sure that the VPs report to the president, and that way, you have a direct path of accountability from the VPs to the president to the Board. And then the president can work with each VP individually… I think that lending the position of the president, which has some power and some political sway, to issues that the VPs are facing is a good way to start to help support them.